The City of Springfield Office of Housing has released its Request for Proposals (RFP) for the Emergency Solutions Grant (ESG) for the program year July 1, 2019 to June 30, 2020. Operating support for established emergency shelter programs. Responses are due March 4, 2019 by noon. Please click on the following link for a copy of the Power Point presentation for the City's Technical Assistance Workshop held on December 20, 2018. The workshop provided technical assistance on how to submit a successful RFP response to the City, including a review of Frequently Asked Questions and provide troubleshooting advice for potential respondents. It is good general information for anyone who may be interested in bidding on an RFP in the future. RFPs will be received until 2:00P.M (EST) on: January 18, 2019 by Chief Procurement Officer, Lauren Stabilo at the Office of Procurement in City Hall, 36 Court Street, Room 307 Springfield, MA 01103. Bid documents and specifications will be available at no charge beginning Wednesday, November 21, 2018 at 9:00am at the Office of Procurement or requesting a copy on the City’s website www.springfieldcityhall.com. November 28, 2018 at 3:00 p.m.
November 28, 2018 at 2:00 p.m.
City of Springfield staff will be offering a pre-proposal technical assistance workshop on December 20th at 2:00 p.m. at 70 Tapley Street, Springfield. The workshop will provide technical assistance on how to submit a successful RFP response to the city. It will include a review of Frequently Asked Questions and will provide troubleshooting advice for potential respondents. It will include examples of successful responses and what RFP Review committee respondents look for when evaluating proposals. City staff will also do a brief overview of CDBG funding requirements and how funding is disbursed. All potential respondents are encouraged to attend. The Chief Procurement Officer may, in its sole and absolute discretion, reject any and all, or parts of any and all proposals; may rea-advertise this RFP if so inclined; postpone or cancel at any time this RFP process; change, adjust, or modify the anticipated schedule of events. The Office of Housing has completed a Housing Study for the Community Preservation Committee. The study provides a snapshot of Springfield’s housing conditions and market, along with a description of City programs and initiatives to address housing needs. The Springfield-Hampden County CoC has released its Request for Proposals (RFP) seeking programs to include in its FY2017 CoC Competition Application. The RFP seeks new, expansion, and renewal permanent supportive housing (PSH), Rapid Rehousing (RRH), and Joint Transitional Housing-Rapid Rehousing (TH-RRH) programs. The program funding period begins July 1, 2018. The RFP and information posted about the opportunity are posted on the website of the Springfield-Hampden County CoC. Please click to visit the website for more information about this opportunity. The City of Springfield has launched a new Healthy Homes Program (HHP), which makes federal housing rehabilitation funds available to owners of 1-4 unit residential properties in the Memorial Square and Six Corners neighborhoods. The program is available for both owner-occupied and rental units. HHP provides funds for home rehabilitation, abatement of lead, removal of asthma triggers, and improvement of energy efficiency. It is an integrated, whole-house approach that produces sustainable, green, healthy and safe homes. Click here to view Press Release. Receivership Auction Notices can now be viewed on the Receivership Auction Notices page under Neighborhood Revitalization. Please click on the link below to view notices of upcoming Receivership Auctions. The Springfield-Hampden Continuum of Care has released the FY16 Request for the Proposals for New and Renewal CoC Projects. The CoC will hold a bidders conference on Wednesday, July 27, 2016 at 10a.m. at the City of Springfield Office of Housing, 1600 E. Columbus Ave., Springfield. Completed applications are due by August 12, 2016 at 4:00p.m. Please see the RFP for complete instructions. The Springfield-Hampden Continuum of Care has issued an RFP for New Project Sponsor for Permanent Supportive Housing for Chronically Homeless Families. The RFP seeks a new operator for an existing project that provides permanent supportive housing to eight families who have been chronically homeless. There will be a bidders conference on Wednesday, July 27, 2016 at 11a.m. Applications are due August 5, 2016 at 4p.m., at the Springfield Office of Housing, 1600 E. Columbus Avenue, Springfield. Please see the RFP for additional information about this funding opportunity. ALERT: Please be advised 15 Massachusetts has been removed from the auction list. The City of Springfield is soliciting proposals for a nonprofit, government or housing authority organization to operate an existing scattered site project that provides permanent supportive housing to eight families who were previously chronically homeless. A bidders' conference will take place October 8, 2015 at 1pm at the Office of Housing, 1600 E. Columbus Ave., and applications must be submitted by October 20, 2015 at 4pm. For more information, please review the Request for Proposals. The Springfield/Hampden County Continuum of Care (CoC) is soliciting proposals for projects to provide assessment and housing for homeless persons. Selected projects will be included in the CoC's collaborative grant application which will be submitted to the US Department of Housing and Urban Development in November 2015. A bidders' conference will take place October 8, 2015 at 2pm at the Office of Housing, 1600 E. Columbus Ave,. and applications must be submitted by October 20, 2015 at 4pm. For more information, please review the Request for Proposals. The City is soliciting proposals for the redevelopment of 803-807 Liberty Street. The building at 803-807 Liberty Street is a brick, mixed-use building constructed in 1916. The building contains approximately 12,906 square feet of living/commercial space and is located on a 5,000 square foot lot and is zoned Business A. The property has four floors and contains approximately nine residential units and two commercial units on the ground floor. The property is being sold "as is" with the adjacent lot at SS Stockman Street (11200-0046). A site tour is scheduled for June 18th at 2:00 p.m. Proposals are due to the Office of Procurement, City Hall, 36 Court Street, Room 307 no later than July 9, 2014 at 2:00 p.m. The City of Springfield has scheduled a ballroom style auction of twenty-five tax foreclosed properties for June 17, 2014 at 6:00 p.m. (registration begins at 5:00 p.m.) at the Good Life Center, 1600 East Columbus Avenue. For additional information you may visit our website or the Posnik Auctioneers' website. The Western Division Housing Court is now accepting applications for the List of Qualified Receivers. Applications are available at the Clerk's Office at the Housing Court. If you are currently on the Court's list, please note that your application needs to be renewed annually! The City of Springfield is soliciting proposals for the purchase and redevelopment of two, tax foreclosed, Victorian row-houses at 174 Maple Street and 176 Maple Street. Thursday, April 24, 2014 at 3:00 p.m.
Tuesday, April 29, 2014 at 11:00 a.m. The City is interested in proposals which will renovate these historic row house to their appearance in 1939 and as approved by the Springfield Historical Commission. The City is most interested in proposals which will renovate both buildings as single-family and/or two-family homes. The City will consider proposals for a three-family house or four-family house for 174 Maple Street and will consider proposals up to three-family for 176 Maple Street. Proposals resulting in lower densities are preferred. Proposals resulting in owner-occupied units, including condominiums, are preferred. Nonresidential uses will only be considered as accessory uses to residential uses. Institutional uses such as group homes, churches, and schools will not be allowed. These properties are located in the Maple Hill Local Historic District, which is both a certified local historic district and listed on the State Register Historic Places. Income producing projects may qualify for the federal and state 20% tax credit for historic rehabilitation. CDBG funds are being made available by the City to be used for exterior repairs. No income restrictions are applied to these funds. CDBG funds will be an interest free, forgivable loan not to exceed $100,000. A total of $200,000 for exterior repairs to both properties is available. Proposals that minimize the use of public funds are preferred. The loan will be paid out as reimbursement of expenditures. Half of the loan will be forgiven upon issuance of a Certificate of Occupancy by the Springfield Building Commissioner. Once the Certificate of Occupancy has been obtained, 20% of the remaining loan will be forgiven each year the property is maintained in compliance with code enforcement over the next five year period. The proposed development should minimize other public expenditures and not require ongoing public operating subsidies. Springfield has been allocated $305,439 in federal Emergency Solutions Grant (ESG) funds for FY14. These funds are to be used for homelessness prevention and rapid rehousing, and to provide some support for existing emergency shelters. The City has released a Request for Proposals (RFP) seeking providers to operate ESG programs. Applications for program funds are due May 12, 2014, by 2:00 pm, at the Office of Housing, 1600 East Columbus Avenue, Springfield, MA 01103. All updates to the RFP will be posted here for public viewing. The City of Springfield has been awarded $21.8 million dollars in Community Development Block Grant – Disaster Recovery (CDBG-DR) funds as a result of multiple presidentially declared disasters occurring in 2011. As a result of this funding the City of Springfield is making $1.4 million dollars available in CDBG-DR funds for proposals for developers for “ready to proceed” single-family, new construction projects that will provide homeownership opportunities to low-moderate income buyers who are within 120% of Area Median Income. The City is seeking projects within a limited area of the Old Hill/Six Corners neighborhoods that was heavily impacted by the June 1, 2011 tornado. The City is most interested in proposals that will create high quality, newly constructed single family homes on each proposed site. The City will entertain proposals that include a second unit, but additional units will not be considered as advantageous as single family proposals. Proposal s should include home re-sale to income qualified buyers within 120% of Area Median Income (AMI). Developers must be able to demonstrate a successful track record in housing development and utilizing comparable federal funds and regulations, ability to comply with CDBG-DR requirements and must site control for all proposed projects. Projects should be ready to proceed immediately and all new construction and expenditure of funds must be completed no later than September 2015. To obtain more details and/or a copy of the Request for Proposal/Notice of Funding Availability please email lstabilo@springfieldcityhall.com. 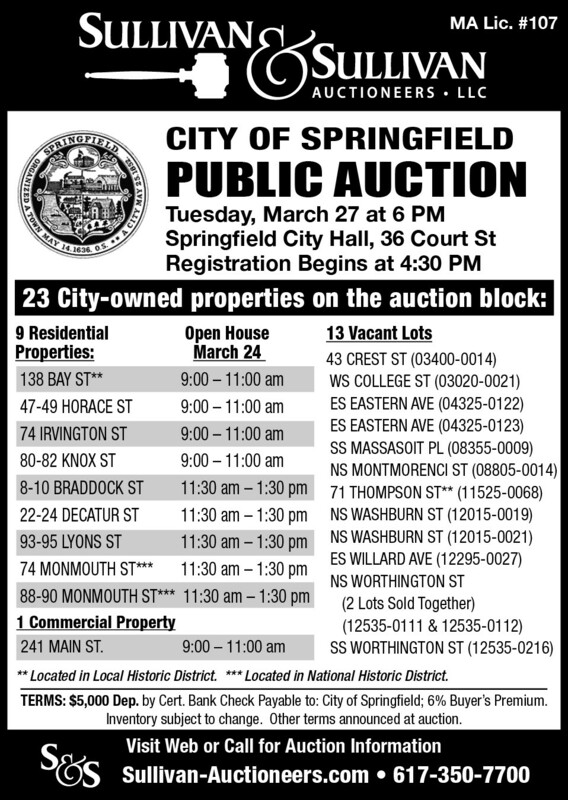 The City of Springfield has scheduled a ballroom style auction of 26 tax foreclosed properties for March 25th, 2014 at 6:00 pm (Registration begins at 5:00 pm) at the Good Life Center, 1600 East Columbus Avenue. For additional information you may visit our website or the Posnik Auctioneers website. The properties are located throughout the Maple-High/Six Corners neighborhood and the Old Hill neighborhood. Both areas were heavily affected by the June 1, 2011 tornado and this Request for Proposals (RFP) is an important piece of the rebuilding process. The City is most interested in proposals that create newly constructed, single family homes on each of these lots. The City is seeking high quality home design plans that are in character with the existing neighborhood. The City is making available a maximum of $800,000 in Community Development Block Grant - Disaster Recovery funds towards the redevelopment of the properties included in this RFP. Proposals will be accepted until April 9, 2014 at 2:00 pm by the Office of Procurement, City Hall, 36 Court Street, Room 307. For additional information you may visit the Office of Procurement website. Click here to view the article by The Republican/Masslive. The City of Springfield is soliciting proposals for the purchase and redevelopment of the multi-unit building at 169 Maple Street. The property is located within the Ridgewood Local Historic District in the Maple-High/Six Corners neighborhood of Springfield. The building is a brick, residential apartment building constructed in 1920, it contains 30,522 square feet and is located on a 7,454 square foot lot and is zoned Commercial A. The assessed value is $390,300. The property has five levels and contains approximately ten, spacious, three bedroom units. Five of these units are currently occupied. Site tours are being conducted on March 12, 2014 at 2:00pm and March 19, 2014 at 10:00am. Proposals are being accepted until April 9, 2014 at 2:00 pm, by the Office of Procurement, City Hall, 36 Court Street, Room 307. For additional information please visit the Office of Procurement website. To view the article from The Republican/Masslive please click here. The City of Springfield through its' Office of Housing is soliciting bids from contractors for the demolition and removal of demolition debris of the former Chestnut Street School site at 495 Chestnut Street. Bids are due by Wednesday, February 19, 2014 at 2:00 p.m. to the Office of Procurement, City Hall, 36 Court Street, Springfield. A mandatory pre-bid conference and site tour is scheduled for February 11, 2014 at 10 a.m. Contact Tina Quagliato at (413)787-6500 / tquagliato@springfieldcityhall.com for additional information. Click here to view bid information from the Office of Procurement. The City of Springfield auctioned 24 tax foreclosed properties on Wednesday, December 11, 2013 and received bids totaling $631,000. The auction was conducted at City Hall by Aaron Posnik & Co., Auctioneers. The highest bid received was for a commercial property at 1130 Bay Street. Click here to view the article by The Republican/Masslive. The City of Springfield through its' Office of Housing is soliciting bids from contractors for the demolition/deconstruction of the condemned building at 2612-2616 Main Street & 3 Arch Street. Bids are due by Wednesday, December 18, 2013 at 2:00 p.m. to the Office of Procurement, City Hall, 36 Court Street, Springfield. The site will be open on December 9, 2013 between the hours of 10 a.m. -2 p.m. Contact Tina Quagliato at (413)787-6500 / tquagliato@springfieldcityhall.com for additional information. Click here to view the article from The Republican/Masslive. Click here for bid information from the Office of Procurement. The City has scheduled a Municipal Auction for twenty-five (25) tax foreclosed properties. The ballroom-style auction will take place on December 11, 2013 at 6:00 p.m. at City Hall, 36 Court Street, Springfield. For additional information please contact the City's private auctioneer Aaron Posnik Auctioneers/Appraisers at (413)733-5238. To view the article from The Republican/Masslive.com please click here. On October 23, 2013 the City of Springfield, in conjunction with the Western Division Housing Court, held a receivership training for current and potential receivers and their attorneys. The training was attended by over 50 people including staff from the City of Springfield, City of Holyoke, Western Division Housing Court, Attorney General Martha Coakley's Office, in addition to many current and prospective receivers. Click here for additional information on receivership and the training materials. In May and June 2013, the City took written comments and held hearings on its Draft Analysis of Impediments to Fair Housing. The City has incorporated those comments into a new document, which has been submitted to HUD and awaits final approval. Click to view the Analysis of Impediments to Fair Housing that was submitted to HUD. The City of Springfield in partnership with Daniel J. Flynn & Co., will be auctioning eighteen (18) tax foreclosed properties on Tuesday, June 18, 2013. Registration begins at 5:00 PM and the auciton will begin at 6:00 PM. The ballroom style auction will take place at City Hall, 36 Court Street, 2nd Floor. Open Houses will be conducted on Sunday, June 9th, 2013 at the various properties. For a schedule please visit the auctioneer's website http://www.flynnauctions.com/. Those who intend to register as bidders should come prepared with a $5,000 bank and/or certified check per property. You may view additional auction information on our website or view the Auction Flyer. The City has released a DRAFT 2nd Neighborhood Stabilization Program 3 (NSP3) Substantial Amendment for public comment. The 2nd Substantial Amendment changes the initial Substantial Amendment by re-allocating $50,000 from homeownership to rental housing targeted to persons with incomes at or below 50% area median income. These funds will be used for rehabilitation of the multi-family property at 71 Adams St. The 2nd Substantial Amendment is available here. Please submit written comments by June 21, 2013 to Geraldine McCafferty at gmccafferty@springfieldcityhall.com or at the Office of Housing, 1600 E. Columbus Ave., Springfield, MA 01103. The City is updating it Analysis of Impediments to Fair Housing, and seeks your input. Click here to see the DRAFT Analysis. To comment on the draft, please send written comments by June 11 to gmccafferty@springfieldcityhall.com or attend a public hearing on the draft Analysis. The hearing will take place June 11, 5 pm, in Room 220, Springfield City Hall. City launches new "Abutter Lot Sale Program"
The "Abutter Lot Sale Program" is designed to sell City-owned, vacant lots, valued under $25,000 to property owners with a home, building and/or property directly abutting a vacant lot. Abutters would be able to purchase approved lots directly from the City without going through a public disposition process such as a Request for Proposal (RFP) or auction. The program will be administered through the Office of Housing will require an application to be made. Please note that if a property is City owned the Office of Housing will investigate whether or not the lot will be eligible for sale through this program. Click here for an application and/or additional information. Eligible Communities: Agawam, Brimfield, Monson, Southbridge, Springfield, Sturbridge, Westfield, West Springfield and Wilbraham. Eligible Households: Homeowners from the nine eligible communities whose primary residences were damaged by the June 1, 2011 tornado and who require additional financial assistance to supplement other public, private and non-profit sources and/or to address needs not met by other funding sources. Eligible Uses: Tornado Response HR Funds may be used for work items or repairs which are not or only partially funded through insurance or other public or donated funding. This may include such things as demolition of detached outbuildings, historic rehabilitation, removal of trees that presenting an obstacle to residents, water damage, mitigation of mold and water damage, and standard building repair such as roofs, windows, siding, etc. In addition, these funds may be used to supplement other funding towards rebuilding homes completely destroyed or the purchase and installation of a mobile home or modular home to replace a home that was destroyed in the June 1, 2011 tornado. All work funded through this program must be performed by qualified and licensed contractors. Under certain circumstances, "sweat equity" through a self-help agreement will be allowed if it can be demonstrated that 1)the owner is capable of performing the work or 2)the effort is being undertaken in conjunction with coordinated volunteers and will leverage additional monies to the project. In these circumstances, an itemized materials cost estimate must be provided accompanied by a quote from the suppliers. Prioritization of Assistance: Requests for assistance will be categorized according to need. Priority 1 Assistance is for those households who need additional funding to complete work which allow them to get back into their home. Priority 2 Assistance is for households who need additional funding to eliminate a health or safety issue within the primary residence. Priority 3 Assistance is for households who need additional funding to eliminate a health or safety issue on the property of the primary residence. Priority 4 Assistance is for all other eligible tornado related requests. Income Restrictions: At least 75% of these funds must benefit households whose gross income does not exceed 80% of the area median income (AMI). Up to 25% of these funds can be used to benefit households whose gross income is between 80% and 100% of the AMI. Assistance Limitations: The value of repairs or improvements made to any individual residence using these funds cannot exceed $7,500 unless an unusual circumstance requires a larger expenditure. In these cases a waiver for up to a total of $15,000 may be sought with the additional funds limited to ensuring the home is made safe and secure. Waiver amounts and availability will be influenced by household income levels. Application: Please contact Laurel Foley-Beauchesne, Pioneer Valley Planning Commission, 60 Congress Street, Springfield, MA 01104 at (413)781-6045 or be email at lfoley-beauchesne@pvpc.org. DevelopSpringfield is pleased to host representatives of the Massachusetts Department of Insurance on May 31st from 4 PM – 8 PM at the Federal Room in the STCC Technology Park, 1 Federal St, Springfield, MA 01105. Commissioner of Insurance Joseph G. Murphy has asked members of his team in the Department of Insurance to meet with residents of Springfield and the immediate area, who were impacted by the June 1, 2011 tornado, and who continue to have questions or concerns about their insurance coverage. The Department of Insurance team will meet with residents one-on-one to answer questions and to provide general guidance. This session will be free and open to the public. If you have questions, please contact DevelopSpringfield at (413) 209-8808. One June 1st, 2012 the Western Division Housing Court's list of qualified receivers for cases involving violations of the State Sanitary Code will be dissolved and reconstituted. If you want your name to be included on the new receiver list when this transition takes place, you must submit an application by April 1, 2012. Afterwards, applications will be accepted on a rolling basis. Applications are available at the Clerk's Office at the Western Division Housing Court, 37 Elm Street, Springfield, MA 01102. For updates and more information, view the flyer or visit the Rebuild Springfield website. The City of Springfield held a successful auction of tax foreclosed properties on Wednesday, November 30. The City of Springfield and HAPHousing have teamed up to create a Rebuilding Guide for Homeowners to assist residents in accessing and identifying the resources they need to rebuild after the devastating tornado on June 1, 2011. This Guide has been generously supported by Develop Springfield. The guide provides detailed information about insurance, FEMA assistance and SBA loans, undertaking construction and working with City agencies, and incentives and information for green building, healthy homes, handicap accessibility and historic preservation. The Guide also tells you where to go for assistance if you need help navigating the system. As individuals and communities are striving to rebuild homes, businesses and lives in the aftermath of the tornado that touched down on June 1, there continues to be many unanswered questions about the recovery process. Many others who were not directly affected by the tornado also have questions and needs. At the Community Rebuilding Fair, attendees will have the opportunity to learn about available programs and have direct access to services. Participants can meet with legal, insurance, financial, housing, zoning, career, construction, and sustainability experts to ask questions and obtain assistance. This community event is open to the public and is FREE. The Community Rebuilding Fair will take place on Wednesday, September 28, 2011 at the High School of Commerce, 415 State Street, Springfield. Between 4:00 p.m. - 8:00 p.m. Location: Springfield NHS - 111 Wilbraham Rd, Springfield, MA. To register please contact Springfield Neighborhood Housing Services at (413) 739-4737, ext. 100. Please contact Springfield Neighborhood Housing Services for a Customer Intake Form-which must be completed in order for registration to be confirmed. Springfield Neighborhood Housing Services is a HUD APPROVED HOUSING COUNSELING AGENCY. “Working Together to Build Strong Communities”. Please contact Springfield Neighborhood Housing Services at (413)739-4737, ext. 100 to register. For more information contact HAPHousing at 413-233-1612 or 1-800-332-9667 extension 1612. HAPHousing will be hosting a FREE HOMEOWNERS WORKSHOP on September 17, 2011 between 9:00 a.m. and 2:00 p.m. at 322 Main Street, Springfield, MA. Space is limited. Sign up today by contact HAPHousing at 413-233-1616 or 800-332-9667 extension 1616. President Obama has declared Hampden County a federal disaster area. This declaration makes certain assistance available to residents and businesses who have sustained losses due to the tornado. Registration may be completed online at http://www.disasterassistance.gov/, or in Spanish at http://www.disasterassistance.gov/?langcode+ES, by smartphone through m.FEMA.gov, or by calling FEMA’s toll-free registration HelpLine at 1-800-621-FEMA (3362). Individuals with hearing or speech impairment may call TTY 1-800-462-7585, or use 711 or Video Relay Service (VRS) to call 1-800-621-3362. Multi-language assistance is available. Telephone registration is available from 7 am to 10 pm, seven days a week. In addition, FEMA has opened a Disaster Recovery Center (DRC) at the STCC Technology Park, One Federal Building, Building #104. Those affected by the disaster can meet with specialists from the Federal Emergency Management Agency, the Massachusetts Emergency Management Agency, the U.S. Small Business Administration and the Internal Revenue Service (IRS). Additionally, representatives from several state agencies under the Offices of Health and Human Services, Housing and Economic Development and Labor and Workforce Development will be available at the DRCs to provide state assistance where available. Catholic Charities, along with other vital federal and state voluntary agencies, will also be represented at the DRCs to help coordinate donations and volunteer inquiries. Please note that, before visiting a DRC, those seeking assistance are strongly urged to first register with FEMA for assistance. The City is requesting all landlords with vacant property that can be used to re-house people displaced by the tornado should contact the Office of Housing at 413-787-6500. Due to the effects and cleanup of the tornado the City has rescheduled the tax title auction of twenty seven tax foreclosed properties on Tuesday, June 19, 2011 at 6:00 p.m. Registration will begin at 5:00 p.m. The auction will be held at City Hall-2nd Floor, 36 Court Street, Springfield, MA. For additional information and to view auction documents please click here. Friends of the Homless with be operating a shelter located at 769 Worthington Street, Springfield, to serve serving individuals without minor children. The Red Cross will be operating a shelter at the Mass Mutual Center located at 1277 Main Street, Springfield, to serve families with minor children and people who are medically compromised. If you have non-emergency questions, needs and/or reports please contact the City's 3-1-1 Call Center at 413-736-3111. The Red Cross Safe and Well website is being used to track residents who have been displaced by yesterday’s tornadoes in the Springfield area. The Safe and Well website is a free, public communication tool where those affected by disasters can register on the site and post messages that they are safe. Loved ones can then conduct a search on the site to view the posted messages. To access the website, please go to www.redcross.org/safeandwell. You can enter yourself as “Safe and Well” if you were impacted by the storm, or search for a loved one you cannot locate. If you do not have access to a computer and the internet, the City’s 3-1-1 Call Center can assist you with entering yourself into the system or searching for a loved one. The number into the 3-1-1 Center is 413-736-3111. Registration computers will be made available at shelter locations within the City of Springfield for residents located at those sites. Please be patient as the database will take time to fill up. If you do not see a loved one listed when you search initially, please check back later. The City's will be holding the next ballroom style auction of twenty seven tax foreclosed properties on Tuesday, June 21, 2011 at 6:00 p.m. Registration will begin at 5:00 p.m. The auction will be held at City Hall-2nd Floor, 36 Court Street, Springfield, MA. City of Springfield receives national HUD "Door Knocker Award"
The City of Springfield and the Commonwealth of Massachusetts were among fourteen nationwide recipients of the HUD "Door Knocker Award" for excellence in producing quality affordable housing. The award specifically highlights the redevelopment of 149-unit Worthington Commons. Worthington Commons, developed by First Resource Development Company, involved the rehabilitation of several historic buildings using a combination of federal grants, tax credits and loan funds. The project is a key component in the turnaround of the downtown Summit Hill Neighborhood. The Office of Housing is seeking additional developers to carry out it Neighborhood Stabilization Program (NSP). Non-profit and for-profit organizations with the technical and financial capacity to acquire and rehabilitate foreclosed or abandoned properties are encouraged to apply. Qualified developers are eligible to apply for federal NSP funds to carry out redevelopment in target neighborhoods in the City. The targeted neighborhoods are Old Hill, Six Corners, the South End and lower Forest Park. Copies of the Request for Qualifications will be available at the Office of Housing starting April 19, 2011. Any questions regarding this RFQ should be submitted in writing no later than May 9, 2011, and will be answered on the Office of Housing website no later than May 13, 2011. All proposals must be received by the Office of Housing no later than noon on May 20, 2011. Developers that have previously been qualified for the NSP program do not need to reapply. The Housing Inspectional Services Division is responsible for enforcing the Massachusetts State Sanitary Code and City of Springfield Ordinances that regulate and improve the quality of Springfield’s public and private housing stock.